You’ve probably heard about both Shure and 1More already, but for those that haven’t, these names represent two outstanding headphone manufacturers. 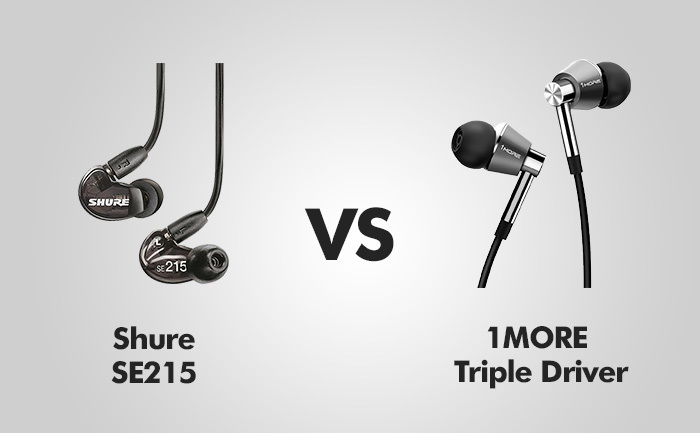 The reason why we’re comparing Shure’s SE215 and 1MORE Triple Driver earbuds is that these models are among the finest in the “medium” price point category. Audiophiles and headphone enthusiasts often compare these two, but somehow the answer to “which is better” still falls short. Let’s check them both out and find it. Shure’s SE215 is outfitted with a set of sound-isolating sleeves that are capable of negating 37 decibels of exterior noise. Their special isolation technology blocks ambient noise and interference, allowing you to benefit from impeccable sound clarity. The ergonomic qualities of SE215’s design can be characterized as “lightweight” with a low-profile shape complemented by the optimized angle of the nozzle. The over-the-ear design ensures optimal comfortability at all times. Shure’s SE215 comes outfitted with a durable cable which is easy to replace and customize. The wire is sturdy enough to withstand quite a punishment, and you can rest assured that it will seldom (if never) get in your way. These headphones feature a titanium-colored aluminum alloy body which weighs approximately 0.63 ounces – good enough to be labeled as “nearly weightless”. These headphones are “in-ear” type, and they feature 32 Ohms of impedance. You’ll be able to use the remote audio controls (for free, unlike with Shure’s headphones), including answer/end call, next or previous track, play or pause, decline a call, toggle volume. The package features three pairs of ultra-smooth foam ear tips, six pairs of premium-quality silicone ear tips, a clothing clip, dual-pin adapter, the travel pouch, and a storage case. The reason why these headphones are better than Shure’s in terms of performance is the BA drivers complemented with the dynamic driver (triple driver system). The soundstage of Shure’s SE215 is inferior to that of 1MORE Triple Driver earbuds, but not by a long shot. Basically, both of these headphone sets perform phenomenally, but the SE215 tends to perform poorly with high-frequency sounds. Both Shure’s SE215 and 1More triple driver headphone sets were built to last. It’s safe to say that 1More headphones win this round – the ear tips of these headphones are thicker, the cable is longer, and the buds themselves are sturdier. This is the first round that goes to Shure’s SE215. You’ll notice that both of these headphone sets belong to the same price point category – they’re in the same sub-group (bracket), as a matter of fact, but the SE215 is slightly more affordable when compared to 1More’s triple driver headphones. Again, both headphones feature silicone ear tips – it’s safe to say that they’re as comfortable as can be, but which model is more comfortable? SE215 features a set of slightly angled ear tips while 1More’s earbuds feature memory-foam inserts. It falls down to subjective preference, but, objectively this one’s a draw. PROS: Excellent value for the money / Superb soundstage / Very comfortable ear tips / Easy control / Durable cable. PROS: Outstanding sound clarity / Pronounced, deep bass / Design / Comes with gratis goodies. CONS: You might need some time to get accustomed to them / Inline mic, as well as the volume control will cost you extra (nearly half the price of the headphones themselves). CONS: The highs aren’t so good, especially with songs which feature pronounced cymbals and high-frequency tones. All things considered, 1More triple driver headphones are better than Shure’s SE215 in terms of sound quality, durability, and versatility. The only field where Shure’s headphones are better is the sphere of price, but the overall value of 1More headphones is substantially higher. That being said, it wouldn’t hurt to point out the fact that both of these models are very valuable for the cash – it’s just that 1More triple driver earphones are better.